HeliCoil Inserts are used for creating stronger internal threads in all metals, composites, Light Metal Alloys . HeliCoil creates longer lasting durable threads, avoids thread over-sizing, increases the possibility of higher torque application in weaker metals, significantly reduces the bolt breaking problems & HeliCoil being made of corrosion resistant stainless steel protects against atmospheric corrosion. 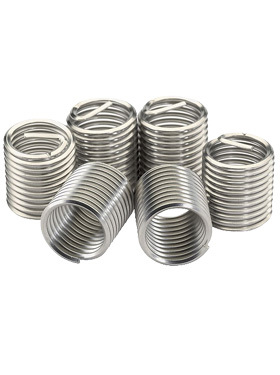 HeliCoil Wire Thread Inserts are available as Free Running Inserts and Screw Locking Inserts, in addition to the standard range of Helicoil available in 18-8 Grades of Stainless Steel such as SS-304 as per AS7245 & DTD 734 specifications also available are HeliCoil inserts of Nimonic 90, Nitronic 60, Titanium alloys, Inconel X-750, Phosphorus Bronze, and various other Space Age Metals. In addition to this HeliCoil inserts are available with protective coatings such as Cadmium Plating, Silver Plating , Dry Film Lubrication Coatings , Primer Free –Salt resistant Coatings to name a few. 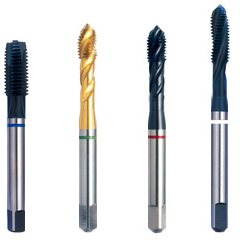 Also available are variety of Thread Repair Kits - HeliCoil Professional Kits, HeliCoil Master Kits, HeliCoil After Market Kits, HeliCoil Insertion Tools, HeliCoil Thread Taps, HeliCoil Thread Plug Gauges, HeliCoil Extraction Tools, HeliCoil Manual Tang Break off Tools, HeliCoil Automatic Spring Loaded Tang Break off Tools and Semi-Automatic & Automatic equipment for HeliCoil installation. We supply HeliCoil Inserts & related tools duly certified conforming to most of the leading international standards by Aerospace, Avionics & Defense Industries such as NASM21209,NASM33537,MS21209, MS122076 ; NASM122076 thru MS122275 ; NASM122275 , MA3279, 3280, 3281,LN9039, LN9499 , AGS3600, AGS3700, AGS4677, BACi12AE, GE N926, NAS1130.